The library browser allows you to easily organise, access and share objects and presets that you use regularly. Forest Pack comes with an expanding range of objects including 2D Billboards, flower, grass and rock 3d models and grass, leaf and stone presets. Additional libraries from XFrog, Evermotion and HQ Plant can be purchased that integrate easily with the library browser, or custom libraries can be created from your own objects. 3D Objects use geometry stored in an external .max file. When used the object can be either XReferenced or merged into the current scene. Forest Pack will use the material assigned to the object in the original file unless specifically overridden. Presets import complete Forest Pack objects, including any combination of Billboards and 3D objects plus all the rules that govern their distribution and appearance. Using presets allows you to quickly share and reuse complete styles without having to set the Forest Parameters for each use. Presets are simply created by referencing a completed Forest Object in an external .max file. To access the library go to the Geometry rollout, select or add a geometry item and click on Properties>Library to open the Library Browser. Use the Tree Navigator to locate your library. Select the library object you wish to use from Items Grid. Either double click, right click and select use item, or click to use. Set area, distribution, transform and other settings as appropriate. Use the Tree Navigator to select your presets library. Select the preset you wish to use from the Items Grid. Either double click, right click and select Use Item, or click Import Selected to use. Most of the Forest Pack parameters will be imported, update the Area or Surfaces controls if required. Select the item you wish to use, note that not all library objects have multiple materials assigned. From the options bar at the bottom of the Library Browser, go to Materials > Using and select the renderer you wish to import a material for from the drop-down list. Select the item you wish to use. The Library Browser is divided into three parts. On the left is the tree navigator, where you select, edit and open your libraries. These are organised into two types of folder. System folders, represented in blue, are the default libraries that come with Forest Pack. These are read-only and cannot be modified. Editable user folders are green and are where your custom libraries can be found. On the right is the Items grid, where the contents of the selected library are shown. Along the top is the toolbar, with several command buttons. To open a library: left click on it. To move libraries: left click and drag to the new location. To copy libraries: left click + CTRL key while dragging. As mentioned system wide folders are read-only, if you wish to modify them, simply make a copy to a User's library folder. Libraries can be copied between computers or shared in a network. When using Billboards, each item has an associated Width, Height, Z Offset and Center Displacement values. To use these parameters in the Forest object, ensure the "Get Size from Library" checkbox in the Geometry panel is on. 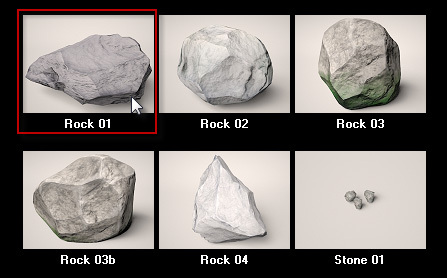 Library items can be configured to use a different materials dependant on renderer. 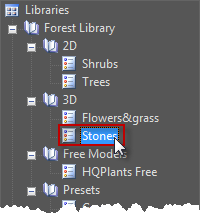 This drop down list allows you to manually select which materials to import, or to let Forest Pack automatically select the best material for the current renderer, leave on automatic. Determines what to do in the event that a material applied to an item shares a name with a material already in the scene. Options include using the scene material, replacing the scene material with the library material, or prompting a decision from the user for each item. Defines how to import the geometry, the default option is to XRef to the library files but it is also possible to merge the original geometry into the scene. Turns on/off any warning prompts related to these settings. Previous folder Go to previous folder. Next folder Go to next folder. Up one level Go to parent folder. Refresh view Forces the reload all folders, libraries and items from disk. Ordering Choose to view items ordered in alphabet or inverse order. Language Choose to view the common name or scientific names in the grid. Zoom out Decrease size of thumbnail images. Zoom in Increase size of thumbnail images. Zoom slider Click and drag right to increase size of thumbnail images and left to decrease size of thumbnail images. Save changes Saves to disk the changes in current library. Edit preferences Open the catalog preferences window. Search Write text to filter items.